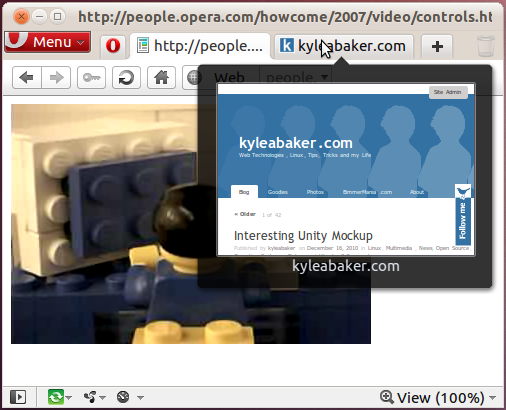 Have you ever wanted to keep an eye on the number of tabs that you have open in Opera? Now you can very easily! I came across a link a while back (sorry, I can’t remember who posted this) for a script in windows that fetches the window count from Opera’s autosave.win file (this file stores your currently open windows and tabs so it can restore them if Opera crashes or for the next time you open Opera). If you’re using Windows, you can probably do something with this script, though I have not tested it yet. If you’re using Linux then you can take advantage of a script that I wrote and I’ll tell you how below. Save this file anywhere you would like to. I saved mine as “opera-tab-count.sh” on my desktop for testing, but it should work fine from any directory. Right click on the file you created and select “Properties -> Permissions -> Execute = True“. This allows the script file to run. One of the main reasons that I wrote this script is to start showing more Opera stats on my desktop via Conky which I wrote about a while back! 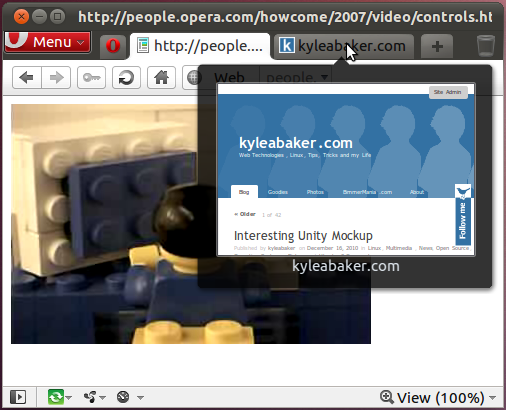 Opera tab count as it will appear in Conky! Move the “opera-tab-count.sh” file that you’ve saved from the steps above into your Home directory. 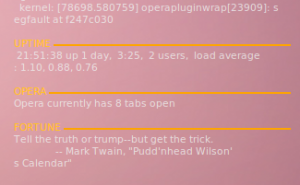 Rename your “opera-tab-count.sh” file to “.opera-tab-count.sh” (notice the leading period). This makes it a hidden file in the future so it won’t waste space in your file browser unless you choose to view Hidden files via “View menu -> Show Hidden Files”. 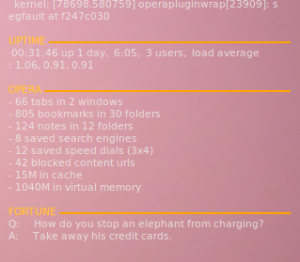 Save your “.conkyrc” file and launch Conky or wait for it to refresh with your update! If you did everything correctly then you should see something similar to what the image above. I do plan to add more stats to this soon and will probably post a link to my script when I’m done, so keep an eye out!